Our professionally trained student-athlete Eureka movers are ready to get you into your new Eureka home. So if you want a trouble-free move, Meathead Movers is the company for you! 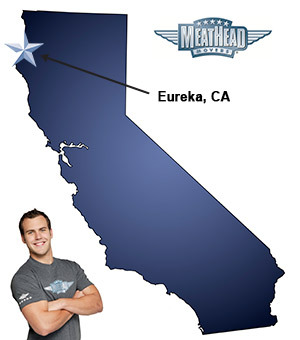 Welcome to Meathead Movers of Eureka! If you are moving for business or for family, we are the Eureka movers for you! Our professionally trained student-athlete movers and moving concierge service are here to help you with every stage of your move in Eureka. Eureka is a hidden gem on the northern California coastline. With scenic Humboldt Bay on one border of the city and giant redwoods lining the mountains on its other border, it is an image right out of a postcard. With all these beautiful scenic views, there are plenty of opportunities for outdoor recreation in Eureka. Residents can enjoy activities like boating, fishing, kayaking, hunting, birding, and backpacking. The city also has a very active arts commission and has the largest number of artists per capita in the United States. This is very evident in the colorful murals that line the streets and Arts Alive!, a monthly exhibit that fills the streets. If you are considering a move to this inspiring and picturesque community, Meathead Movers is here to help. Our moving company specializes in local, long-distance, and commercial moves to, from, and within California. We also provide reliable packing, storage, on-site relocations, and our distinctive moving concierge service. All our student-athlete Eureka movers are thoroughly screened and trained before their first move. With branches throughout California, we are your one-stop resource for all your moving needs. We have been revolutionizing the moving industry since 1997. When you entrust your move to Meathead, you can rest assured knowing that your move will be a success because our professionally trained student-athlete Eureka movers are the best movers the industry has to offer. In fact, you can see what your neighbors have to say about us. With our 100% satisfaction guarantee, the only thing you have to lose is the stress that comes from moving! So contact Meathead Movers today for a free moving quote and learn how we can help you on your next move! Moving to Eureka? Here are some helpful resources.